I tend to wait patiently for volumes when it comes to trade format comics. Sometimes that wait can feel long, not because they are taking their time, but for the simple fact- I want to read it now! 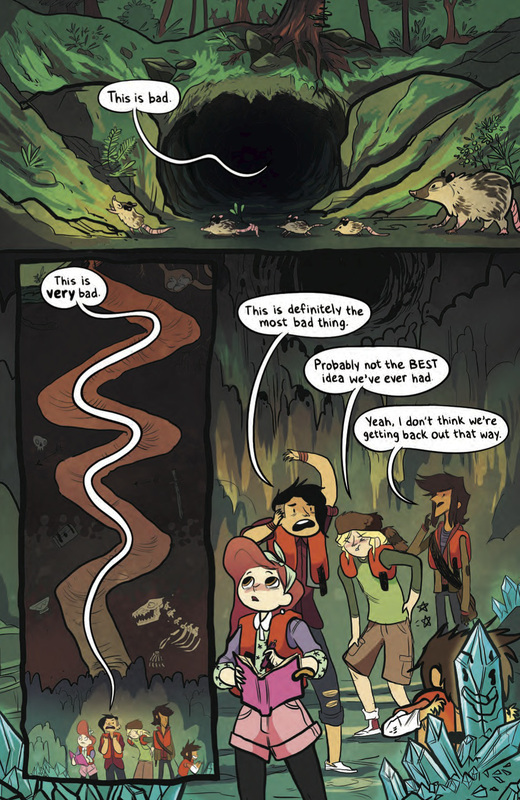 This is how I felt with Lumberjanes, written by Noelle Stevenson & Grace Ellis (illustrated by Brooke Allen). Many friends have been raving about this title and the first volume (issues 1-4) does not disappoint. The story takes place at Miss Qiunzilla Thiskwin Penniquiqul Thistle Crumpet's camp for hard-core lady-types. Campers Jo, April, Mal, Molly, and Ripley quickly learn there is more than meets the eye at this camp. Three-eyed foxes, sea monsters, secret caves, hipster yetis who like music, puzzles, zombie-esque brainwashing. Together these friends work together to navigate each challenge as it arrives. That only is just a brief description. To add, I feel like this story is going to have more to tell from these characters and their relationships, not just what supernatural forces are at work near Miss Qiunzilla Thiskwin Penniquiqul Thistle Crumpet's camp for hard-core lady-types. You may also find yourself saying things like "Friendship to the Max" and "Beware the Holy Kitten," which is completely acceptable. Here are a few samples from Vol. 1 of Lumberjanes. I hope they entice you to check out this title. I, for one, will be patiently watching for Vol. 2, which is scheduled to be out on October 20th, 2015.